Means-tested Bursaries are the main form of financial support for children at Woodhouse Grove School. They are not offered at Bronte House (2-11 years). Bursaries can only be applied for once the full admissions process has been undertaken and a place has been offered. The number of bursary requests for places always exceeds the financial support available, so unfortunately we do have to disappoint a number of families. There are typically around 10 bursaries offered for Year 7 places. Bursaries have to be applied for on an annual basis so that any material changes in circumstances can be taken into account. Bursary Awards are made from limited resources and demand for these places is more than the funding available so strict financial and academic criteria are applied when making decisions regarding the Awards given. Please note that the School does not offer Awards to cover 100% of the fee. Bursary applicants must show a degree of recognised merit through the admissions process, namely in the Entrance Exam, Interview and report from the applicants current school. Those who meet this criteria will be invited to submit a Bursary Application. Please note the offer of a place doesn’t confirm that a bursary application can be submitted. Household gross income, assets and liabilities will be considered. Awards will be made on a sliding scale according to the families’ financial circumstances at the time of application. As well as income, other elements will be taken into account when deciding the Award percentage. 2. Where it is the view of the School that the lifestyle of the family in question could be adapted to accommodate school fees. For instance, if this lifestyle includes: the possession of luxury vehicles or similar assets; taking multiple or costly holidays; the payment of school fees to another independent school for another child or children. For families in membership of a Methodist Church, means-tested bursaries are also available via a fund administered by the Board of Management of Methodist Schools. Sixth Form Academic scholarships are awarded following an interview; these are subject to actual GCSE grades. 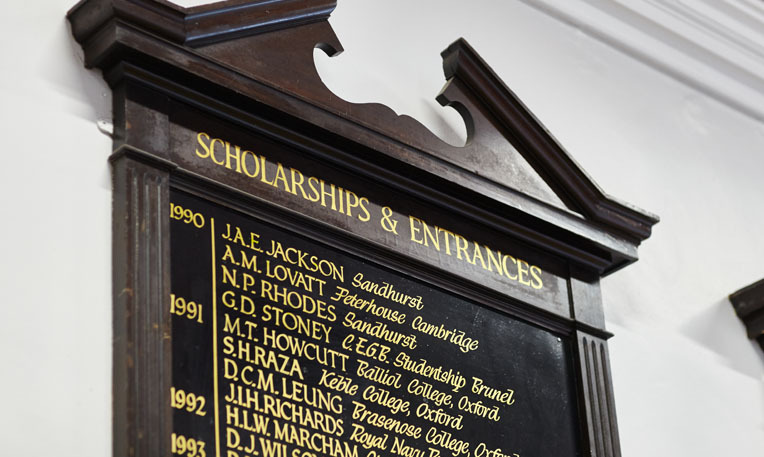 There are a limited number of Headmaster’s Scholarships, awarded annually to exceptional candidates entering the school. These are awarded as a discount on the full boarding or day fees. These awards can also be supplemented by a means tested bursary should the financial circumstances of the family necessitate it. Scholarships cannot be applied for and are awarded to exceptional candidates who excel throughout the admissions process (results of the entrance examination, a pupil interview and a report from the applicant’s current school). Scholarship recipients will be informed of their award in their offer letter. In addition to the honour of a scholarship it will also have a monetary value per annum which will be deducted from the school fees. The exception to this is Music Scholarships, which can be applied for when entering into Y7, more information about these scholarships will be sent out with assessment information. Children must have passed Grade 3 in their chosen instrument to be invited to a scholarship audition. Headmaster’s Awards for Music, Drama, Sports, Art and Design Technology are available in the Sixth Form upon application to the Headmaster. These are awarded based on audition/portfolio or evidence of achievement. Scholarship awards are fixed at the same level throughout a pupil’s career at Woodhouse Grove but are subject to the scholar maintaining a satisfactory level of work, behaviour and academic progress. The siblings allowance amounts to 5% of the fee discounted for the second child, 7.5% for the third child and 10% for the fourth child in the family; these discounts apply in ascending age order. The Forces Allowance is a small additional award available to parents in the armed services that contributes towards the difference between the MOD allowance, the School Fee and the Minimum Parental Contribution required by the armed services. For further details of any of the financial support available please contact the Headmaster or Finance Director.